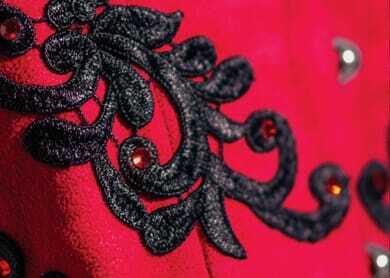 Sensuously plush velvet in lipstick red unabashedly mouths its own namesake to onlookers and suitors alike. Jet black cords intricately braided together define the semi-sweetheart neckline, while shining vegan leather trims the waist, combining with black lace floral scroll work picked out with sparkling red Swarovski to underscore the complex but very feminine and alluring nature of that hinted sin. Read more about Cardinal Sin in Modern Romance.